Revelation, part of the Bringing the Bible to Life series, a companion to Zondervan's NIV Application Commentary, explores both the historical meaning of the biblical text and its contemporary significance. 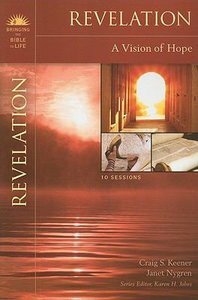 Revelation provides a journey through the biblical book, ten sessions with discussion questions, and a closing section that assists you and your group in responding to God's Word together or individually. - Publisher A series of Bible study guides following the format and content of the NIV Application Commentaries Series. Each study looks at the original meaning, bridging contexts, and contemporary significance of the text, and offers small group participants a better understanding and relevant application of the biblical material to their daily lives. About "Revelation (Bringing The Bible To Life Series)"
A series of Bible study guides following the format and content of the NIV Application Commentaries Series. Each study looks at the original meaning, bridging contexts, and contemporary significance of the text, and offers small group participants a better understanding and relevant application of the biblical material to their daily lives. Craig S. Keener (Ph.D., Duke University) is Professor of New Testament at Palmer Theological Seminary, Eastern University. He is also the author of many books, including commentaries on Matthew; John; Revelation (New International Version Application Commentary); The Spirit in the Gospels and Acts: Divine Purity and Power; Paul, Women, and Wives: Marriage and Womens Ministry in the Letters of Paul and And Marries Another: Divorce and Remarriage in the Teaching of the New Testament. Janet Nygren is currently the Women's Ministry Coordinator for the Princeton Presbyterian Church (PCA) in Princeton, NJ. Order now to secure your copy when our stock arrives. Other edition is available. 0310494109 0 Available. Expected to ship in 7 to 8 weeks from Australia. Order now to secure your copy when our stock arrives. Other edition is available. 0310493404 0 Available. Expected to ship in 6 to 7 weeks from Australia. A series of Bible study guides following the format and content of the NIV Application Commentaries Series.